Treat your complaints of gastritis, acidity, oral ulcers, GERD and IBS and many other diseases by acupuncture, without drug. Treatment by expert MD specialist with 40 years experience at modern 4.5 Star* rated clinic in Nashik. Acupuncture has side effects! Gastritis Symptoms include, upper abdomen or in back burning pain is main symptom. Gastritis pain can be aching, gnawing or vague sense of discomfort. Belching, nausea, vomiting, bloating or feeling of fullness may be other reasons. Untreated acidity may cause ulcers, gastro-oesophageal reflux disease (GERD). Hyperacidity also called as heartburn or indigestion is excess secretion of gastric acid. It is triggered by some food and caused by mostly by Helicobacter pylori and non-steroidal anti-inflammatory drugs. 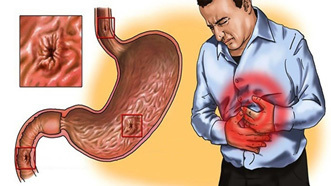 Causes of gastritis can be infection like H Pylori, spicy food, alcohol, certain drugs, corrosive chemical, medical and surgical situations and stress. One of the most important tools to diagnose gastritis is by a gastroscopic examination. This examination entails the taking of tissue samples to make sure that an ulcer gastric cancer can be ruled out. Acupuncture modulates various biomechanical reactions, such as anti-nociceptive effects prokinetic and antiemetic. Acupuncture may also activate the hypothalamus and the pituitary gland, which results in a broad spectrum of systemic effects. It may be effective in patients with functional gastrointestinal (GI) disorders because of its effects on GI motility, acid secretion and visceral pain through somato-parasympathetic pathway. It is effective in abdominal pain, colic, gastritis, hyperacidity, gastro-oesophageal reflux, abdominal bloating, and irritable bowel syndrome. It is expected that acupuncture is used in the treatment of patients with functional GI disorders. Gastritis medicines are antacids, H2 blockers, antibiotics and anti-emetics. Gastritis cure is not difficult, if all necessary care is taken. When acidity treatment medicine, like antacids, does not help; H2 blockers etc are also prescribed. If life style changes and diet does not help, antacids are prescribed. Natural remedies for heartburn give stress on its prevention. Acidity treatment in home includes avoiding food and beverages that exacerbate complaints. You can prevent acidity by healthy weight, eating more fruits and vegetables, having small-sized meals at regular intervals, having dinner at least 2 hours before sleep, at least 3 lit of water a day, exercising. Gastritis symptoms treatment begins with avoiding trigger factors like food and alcohol. Gastritis relief to great extent is also achieved by being aware of drugs that cause the complaints. Natural gastritis treatment included being stress free. Gastritis diet recommendations advise to avoid spicy food. Gastric diet should not have coffee. Gastritis meals if have lot of fried items, it will increase the symptoms. Gastritis food recommendation if strictly followed will reduce symptoms to great extent. If you follow diet gastritis treatment guidelines and use gastritis treatment natural remedies you almost don’t need drugs. Patients report having taken Ayurvedic treatment for gastritis and reported some relief also. Acidity treatment in homeopathy and acidity treatment in Ayurveda are also said to helping patients. Acidity treatment in Hindi speaking population is largely ingenious therapies, like herbs and other heartburn remedy. In recent years acidity treatment by Baba Ramdev has caught up general attention but efficacies of all these approaches are not known. Gastritis treatment in Ayurveda in Hindi speaking areas is said to be quite effective. 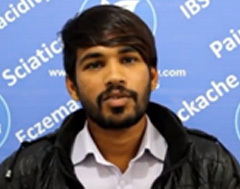 Similarly, Homeopathic treatment for gastritis pain has also have some satisfied patients. Acupressure treatment for gastritis has limited scope. Heartburn called indigestion is common complaint of burning chest pain. Some feel acid reflux symptoms of food being coming back into mouth with bitter acidic taste. Acid reflux symptoms may last for hour or two. GERD cough may be very violent due to entry of gastric content entering into trachea. It may sometimes seem like heart attack but there are distinct differences. Heart attack is associated with physical activity. What is gastro oesophageal reflux? It is gastric reflux or return of gastric content or including acid back into oesophagus from stomach due to lax muscle sphincter at end of oesophagus. Normally once food enters stomach, it is not allowed back into oesophagus by Lower Oesophageal Sphincter (LES). When it does return as in GERD, it causes various complaints. 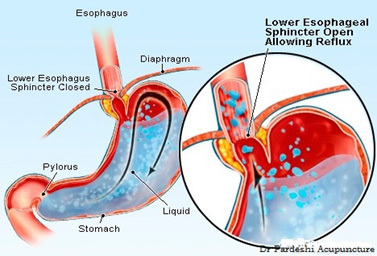 Esophageal reflux disease may also be due to hiatus hernia. It is manageable by GERD diet, its timings, life style changes and acupuncture. Sometimes stomach may also partly lie in chest cavity through opening for oesophagus. In such situation gastric content may easily be regurgitated back into oesophagus. Weakened LES in hiatus hernia may be what causes acid reflux. Many people with hiatus hernia may however, may not have complaints of GERD. Certain food like chocolates, peppermint, fatty items, and coffee alcohol may trigger GERD. Acupuncture alleviates gastroesophageal reflux disease (GERD). It significantly reduces instances of heartburn, acid regurgitation, chest pain, and indigestion. Acupuncture significantly improved scoring indices for esophageal dysmotility, GERD symptoms, and lower oesophageal sphincter pressure. Electroacupuncture techniques used to achieve the positive patient outcomes are easily implemented in both outpatient and inpatient settings. Acupuncture is successful in the treatment of GERD and associated esophageal dysmotility (Liu et al.). Acid reflux medicine include, antacids, H2 blockers like Zantac and proton pump inhibitor may be required if simpler lifestyle modification do not give acid reflux relief. Sometimes acid reflux medication fail to give reduce acidity symptoms or acid reflux cure. In such case further investigations are required for GERD cure. Home remedies for heartburn include, life style adjustments as essential natural cures for acid reflux. Dietary changes to avoid certain food will reduce heartburn symptoms. Reducing portion of diet and food timings may be acid reflux treatment of most of patients with gastric reflux. GERD diet food list to avoid include chocolate, coffee, alcohol, fatty items. Reducing weight by obese patients is important and natural remedies for GERD. Stopping smoking is one of important natural remedies for acid reflux. Elevating head end of bed can be effective heartburn remedy. Eating meals at least 2 to 3 hours before bed time may good home remedies for acidity by allowing the acid in the stomach to decrease and the stomach to empty partially. In very small percentage of patients where every acid reflux remedy fails, surgery can be considered. Mouth ulcers also called as canker sore, are mouth sores which include tongue ulcer, lip ulcer, gum ulcer or sore gums. These oral ulcers sometimes also called as aphthous ulcers can be painful while eating drinking or brushing. These blisters in mouth are harmless and clear on their own. They need medical attention if they last for more than three weeks. Smoking and certain drugs can also be reason for oral ulcers. Oral ulcers causes are not known exactly. Stress or tissue injury is thought to be cause of simple ulcers. Sharp tooth can also be cause sometimes. Certain food like lemon, pineapple can trigger ulcers. Certain vitamin deficiency like vitamin B12 can cause oral ulcers in children. Generally there is no need of oral ulcer treatment, tongue ulcer treatment, gum ulcer treatment lip ulcer treatment as they heal themselves within few days. If they persist, doctor may prescribe mouth ulcer medicine like local microbial. Mouth ulcer ointment like steroid can also be advised. Best medicine for mouth ulcer is oral hygiene. Though there is no cure for mouth ulcer cure, they heal themselves if they recur. Acupuncture is effective in treatment of mouth ulcers.